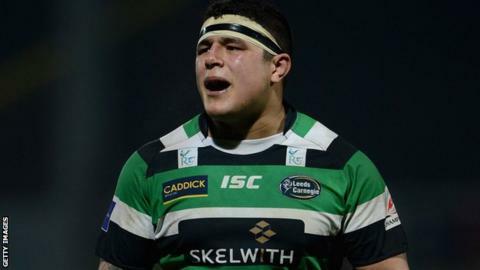 Jersey prop Sam Lockwood says their 29-18 Championship win at Moseley is a "turning point" in their season. It was the Channel Islanders' first-ever victory at Billesley Common and moved them off the bottom of the table. The match was significant for Lockwood, 27, who skippered the team for the first time with Alex Rae out injured. "That win is massive for us. There are big turning points early on in a season and that's one of them," Lockwood told BBC Radio Jersey. "It was an honour to be asked to captain the side, but we all know that Rae is our captain and I'll be happy for him to take it back off me." Jersey are now above Moseley after their first away triumph of the campaign. Head coach Harvey Biljon had 11 players injured going into the game, including Lockwood, but he recovered in time to take the armband. "We spoke throughout the week about how important it was to get a win. It looks like a good start to the season now," added Lockwood. "If we'd lost we'd be bottom and looking like we haven't had a great start, even though we know we've played good rugby."